This five day course provides the knowledge and practical hands-on skills that building contractors, designers, consultants and advanced students need to build to the Passive House standard; an internationally recognized ultra-low energy standard. This course focuses on building enclosure optimization and provides a foundation in passive house principles, while stressing the importance of construction fundamentals and proper sequencing and using a variety of materials. An introduction to heat and energy recovery ventilators will be provided. Students should have prior knowledge/experience in the construction industry or related fields. 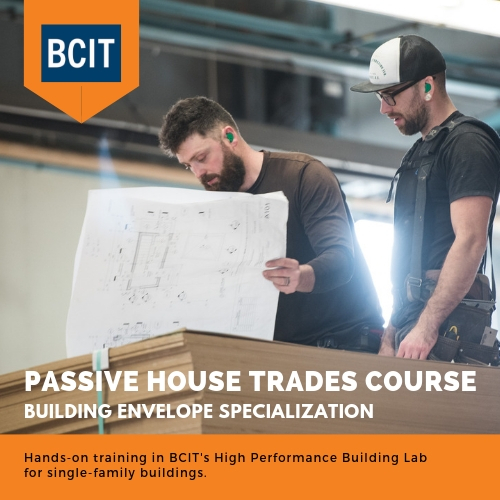 Students who complete the course are eligible to write the exam to become a Certified Passive House Tradesperson – Building Envelope Specialization through the Passive House Institute. Exam registration and payment is to be done separately through Passive House Canada. This course will take place in a classroom/lab workshop with a combination of lecture and hands-on construction material. The following equipment is required: CSA approved safety footwear (green triangle), and clothing suitable for working in a construction environment. This course is set at 36 hours in total will have a 45 minute lunch break.